Last week we asked which conference you’d attend if you had a free ride. 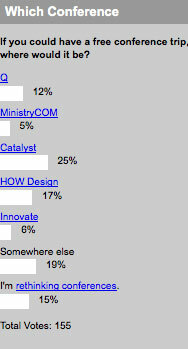 The clear winner was the Catalyst conference with 25% of the vote (Don’t forget about 10% off to Catalyst West). Next came the famous “Somewhere else” conference at 19%–wait, that’s not a real conference. So where else would you rather go? NRB? CSC? SXSW? WOA? OK, SXSW, totally. But let us know in the comments what conferences you think are worth attending. Up next was the HOW Design conference at 17% (our own Michael Buckingham will be there again this year). The whole “I’m rethinking conferences” idea came in next with 15%. Considering we were asking about a free trip and not just your favorite conference, maybe it’s not just the cost and people are serious about conference overdose. Next came the Q conference at 12% (Don’t forget about the CFCC meetup, though you missed the discount deadline), Innovate at 6% and MinistryCOM at 5%. You can always check out the Events Lab for a complete list of upcoming church communications-related events. This week we’re asking about the importance of your church’s web site. Of course I voted Catalyst! You guys sent me there last year. Thanks alot BTW. It was a very meaningful experience!